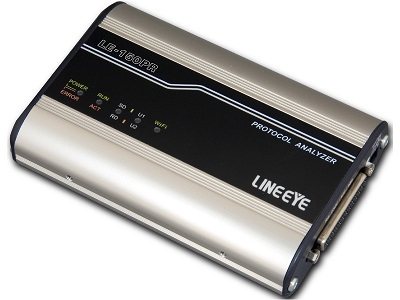 LINEEYE Co., Ltd released the new PC-connectable protocol analyzer "LE-150PR", a analyzer/data logger for asynchronous communication of RS-232C/RS-422/RS-485 which supports remote monitoring by Wi-Fi. The conventional model �gLE-150PS�h released in 2011 supports the two ways of use - the remote mode in which the analyzer is connected with a PC and the logger mode in which analyzer log data into a SD card - and has received a favorable reputation. However, some users told us that they want to connect the analyzer with PC by Wi-Fi or check the log files in the SD card without stopping the logging. 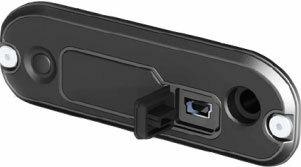 This time, LINEEYE Co., Ltd released the new model �gLE-150PR�h which supports connection with PC by Wi-Fi and you can access the log data in the SD file from PC by Wi-Fi. As same as the conventional model, LE-150PR is a low-cost model for monitoring of asynchronous communication which supports RS-232C/RS-422/RS-485 as its standard target interface and supports TTL monitoring by using an expansion option. By connecting it with PC by USB or Wi-FI, it serves as a high-quality protocol analyzer with the online monitoring function which supports arbitrary speed and the simulation function. 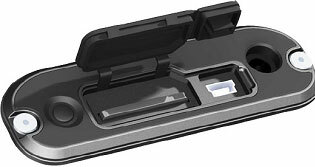 Without connecting with PC, it serves as a communication data logger which log the communication data into a SD card. Even though when it runs in logger mode, you can access and read the log files in the SD card by connecting it with PC by Wi-Fi. It is more useful than before for the analysis of an incidental error or trouble which occurs at a site. The analyzer adds high-precision time stamp to the captured communication data and the data can be displayed on PC and be converted to a text file or CSV file. The schedule measurement function with which you can specify the starting and ending times of the measurement makes the long time continuous monitoring more efficient. The �gInstant power failure prevention�h function prevents the logged data from being broken by sudden power failure while accessing the SD card. The analyzer supports the installation to 35mmDIN rail by using an option. It is extensively useful for not only the development/evaluation of communication devices, but also for after-services or installation to a testing line. It supports measurement of arbitrary communication speed (4 valid digits). Communication log can be saved for long time into a SD card inserted to the analyzer or into a HDD of connected PC. Back up control for sudden power failure to ensure the logging to a SD card. Trigger function can control external signal output terminal and user defined LED. By the simulation function you can transmit registered character line by simple operation. The small body can be installed on a 35mm DIN rail. Logger mode: External DC power (DC7-34V), AC adapter (6A-181WP09). *3:Wi-Fi function is valid only in Japan, USA, and Canada. *4:AC adapter is sold separately. In the Remote mode (with PC), it runs by the USB bus power. In the Logger mode (PC-less), you need to have the optional AC adapter (6A-181WP09) or use the optional Power Plug Cable (SIH-2PG) and external DC power.